Hillary Clinton suffered a social media "oops" this week when her campaign tweeted a photo of the candidate shaking hands with a man whose forearm featured a tattoo that says "white." 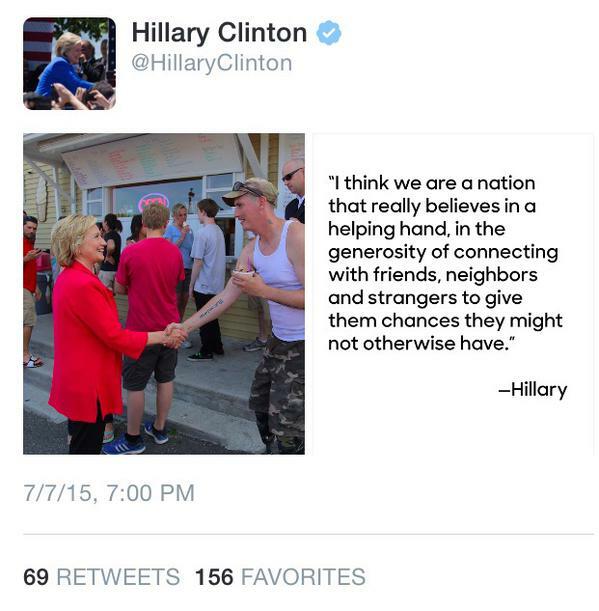 The photo was taken on July 3 in New Hampshire where she spent the weekend meeting and speaking with voters. Clinton's campaign says she was greeting people along the street when the man approached and asked to shake her hand. She obliged as candidates do. The Internet quickly pointed out that the image wasn't necessarily the best picture to represent the "every American" message being touted. The Clinton campaign said the tweet and photo were "removed out of caution after people pointed out the tattoo," according to BuzzFeed.